When traveling on extended trips it pays to have your suitcase packed in a highly organized fashion. This is important on short trips as well, but longer trips require more stuff and therefore more thoughtful packing. The products that I have used for the last ten years are the packing solutions from Eagle Creek. Mr. Misadventures actually introduced these to me when we first started dating. At first I was not convinced that they worked. To me it felt like that actually took up more room in the suitcase than to make without them. But now I am a convertee. I use several sizes and can pack a lot into my large R.E.I. bag. It keeps everything organized and in one spot. As I use my clothes etc. and the bags empty, they take up so little space in my suitcase, they practically become non-existent. Of course I use them to pack and organize any new clothes that I pick up along the way! 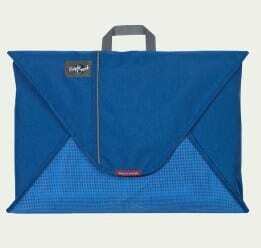 I have had my set of 3 18-inch folder2; 3 Pack-it half cubes; plus my Eagle Creek toilet kit for nearly 10 years without needing to replace any of them – that is value for your money! One last tip. I slip a scented dryer sheet into each one of the bags. During my trip as I unzip each one I get I nice clean scent, nothing smells stale. Then as my dirty clothes bag fills up, I insert the dryer sheets so that the dirty clothes don’t smell up my suitcase – it’s great! How about you? Do you have any tried and true organizers? @Sandy, you’re welcome, I always look out for other people’s experiences with products I am interested, it helps me figure out what the best stuff is! I have used Space Saver bags but now I’m interested in trying those packing bags to see if they work better! And that dryer sheet tip is awesome, thanks! Impressive. I try, but I find I’m always packing at the last minute, so organization would be one extra step. Such a great idea about the scented sheet! The dryer sheet is a great tip. Takes up no room and really does the trick. I’m going to have to remember that.